Sepsis—triggered by uncontrolled infection that causes systemic inflammation—remains one of the most serious (and underappreciated) challenges facing modern healthcare, leading to multiple organ failure associated with high mortality in affected patients. Early detection of sepsis and treatment with antibiotics is thought to be key to reducing mortality; however, the clinical symptoms defining sepsis are in a constant state of revision, and current methods may take 2–3 days to confirm a suspected diagnosis. Meanwhile, a recent study suggests that treatment with antibiotics even at the earliest possible opportunity may not significantly enhance patient survival1. This observation brings into focus the importance of treating the systemic inflammatory response that drives the pathophysiology of organ damage, a key target for reducing mortality in sepsis. One of the immune cell types affected by the systemic inflammatory response of sepsis is the neutrophil. The function of neutrophils depends on their ability to sense, integrate and prioritize between a wide range of inflammatory signals, and to respond to these stimuli in an appropriate manner. The Irimia lab has focused on how neutrophil behaviour provides a lens through which to study the cumulative effects of complex and perturbed inflammatory pathways in the context of physiology and disease. Studies from the Irimia lab and others have demonstrated that neutrophil behaviour is greatly perturbed in sepsis, and that pharmaceutical intervention to correct neutrophil activity can reduce mortality significantly in a rat model of sepsis2. It is therefore possible that perturbed neutrophil behaviour may not only be a hallmark of the hyper-inflammatory sepsis condition, but may also contribute directly to the pathophysiology of the syndrome. Before joining the Irimia lab in 2015, my research on inflammation and infection had been based exclusively on zebrafish larvae, which is an excellent model for direct observation of innate immune cell activity in vivo. From a personal perspective, the microfluidic approaches pioneered by the Irimia lab for the study of human leukocytes represented a complementary toolbox for studying primary human immune cells, and a logical progression toward the translation of findings from the bench to the clinic. After overcoming a very steep initial learning curve regarding design and fabrication techniques, the device utilised in our study just published in Nature Biomedical Engineering represents one of my earliest successful attempts in microfluidics. The similarities in shape and dimensions between the commonly used zebrafish tail transection inflammation assay and the migration mazes in our new study may or may not be a coincidence. The idea to assay spontaneous cell motility in this study was born out of observations of neutrophils isolated from the blood patients with burns by Dr. Caroline Jones, an earlier Research Fellow in the lab. Like many before her, Caroline noted a ‘defective’ chemotaxis of neutrophils isolated from these patients, revealed by the absence of a significant increase in migration in response to a chemokine gradient, compared to chemokine-negative controls. Because Caroline was using a microfluidic chemotaxis assay rather than standard Boyden chambers, she could analyse detailed live cell tracking data, which revealed that this defect in chemotaxis could be largely attributed to increased spontaneous neutrophil motility in control conditions lacking a chemokine gradient. From these observations, Caroline formulated the Neutrophil Activation Score for isolated patient-derived neutrophils exhibiting spontaneous motility in straight microfluidic channels, which provided substantial diagnostic value regarding development of sepsis in this patient cohort3. Designing a device for use with whole blood had the practical aim of reducing the time and cost associated with isolating neutrophils using negative selection, while also minimizing the volume of blood required. Use of the device is also simple, and only basic training is necessary for its operation. Crucially, our experiments with swapping plasma between blood samples from healthy donors and patients also demonstrate the importance of performing the assay in the presence of plasma factors that provide non-cell-autonomous signals to drive spontaneous neutrophil motility. The design elements in this device that enable the use of whole blood represent an evolution of red blood cell filter approaches developed previously4 in the Irimia lab by a gifted technician, Bashar Hamza, now a PhD candidate at MIT. In this case, because our assay measures motility in the absence of a chemoattractant gradient, we could substitute tall chemokine reservoirs (in which neutrophils climb the walls and leave the plane of imaging) for a simple maze. The introduction of a maze also added to the complexity of neutrophil behaviours that we could measure compared with previous straight-channel designs, while still providing directional constraints to facilitate motility patterns that are simpler than those of cells migrating in vivo or on an open plane. Based on previous leukocyte migration analysis approaches that I developed in the zebrafish model, I defined 13 motility parameters, which then needed to be identified from cell tracking data and correlated with the condition of the donor. Although we later simplified our analysis to ‘non-sepsis’ and ‘sepsis’ classifiers, we initially categorised patient conditions as ‘non-sepsis’, ‘systemic inflammatory response syndrome (SIRS)’, ‘sepsis prior to clinical confirmation’, and ‘sepsis’, among patients with clinically-confirmed sepsis. For good measure, we also included healthy control samples, although these were later excluded from the study to focus on the more relevant controls of patients in an intensive care unit (ICU) who were very sick, but did not have sepsis. Thankfully, analysis of this rather complex dataset was expedited by the coding prowess of a very talented research engineer, Julianne Jorgensen, now a lab manager and technician at Stanford University. Using machine-learning approaches, we could efficiently identify which of these behaviours provided predictive value for stratification of the sample subsets, in an unbiased manner. By integrating the five behaviours that we identified into Caroline’s Neutrophil Activation Score algorithm framework, we defined the ‘Sepsis Score’. To our delight, the Sepsis Score was able to correctly stratify 97% (68/70) of all samples into ‘sepsis’ and ‘non-sepsis’ groups (Fig. 1B), with 100% accuracy for day 1 samples (Fig. 1A). Some of these samples were collected from patients who would not be clinically diagnosed for 2-3 days after the sample was taken! Figure 1. Identification of samples from patients with sepsis using the Sepsis Score. A) The sepsis score identified sepsis with 100% accuracy in day 1 samples from the Derivation cohort. B) Sepsis scores from patients with (red lines and symbols) and without (blue lines and symbols) sepsis followed over time in the Derivation Cohort. C) The sepsis score also identified sepsis with 100% accuracy in day 1 samples from the Validation cohort. D) Sepsis scores for patients followed over time in the Validation cohort. Figure adapted from our paper; Macmillan Publishers. The first cohort of patients in this study were trauma patients with severe injuries (considered to be at high risk of sepsis), who we followed longitudinally during their stay in the trauma unit at Mass General Hospital. Although a slowing factor for our study, it is a credit to the unit that only 5 of the 23 patients developed sepsis over the 12 months we followed them for. To reduce the number of patients needed for the double-blind validation cohort, our clinical coordinators Drs. Jarone Lee and Vicki Sein provided us with samples from patients with clinically-confirmed sepsis, as well as a selection of control samples from at-risk ICU patients with SIRS (in the absence of infection), and a range of other complex co-morbidities. Although the excellent performance of the Sepsis Score in the derivation cohort gave us some confidence, we had to check (and re-check!) the results before we believed how well it performed in the validation cohort (Fig. 1C,D). We are very excited about the potential of this assay and look forward to testing its application in the context of both early identification and monitoring of sepsis in a diverse range of patients. Our paper: Ellett, F. et al. Diagnosis of sepsis from a drop of blood by measurement of spontaneous neutrophil motility in a microfluidic assay. Nat. Biomed. Eng. (2018) doi:10.1038/s41551-018-0208-z. 1. Alam, N. et al. Prehospital antibiotics in the ambulance for sepsis: a multicentre, open label, randomised trial. Lancet Respir. Med. 6, 40-50 (2018). 2. Kurihara, T. et al. Resolvin D2 restores neutrophil directionality and improves survival after burns. FASEB J. 27, 2270-2281 (2013). 3. Jones, C. N. et al. 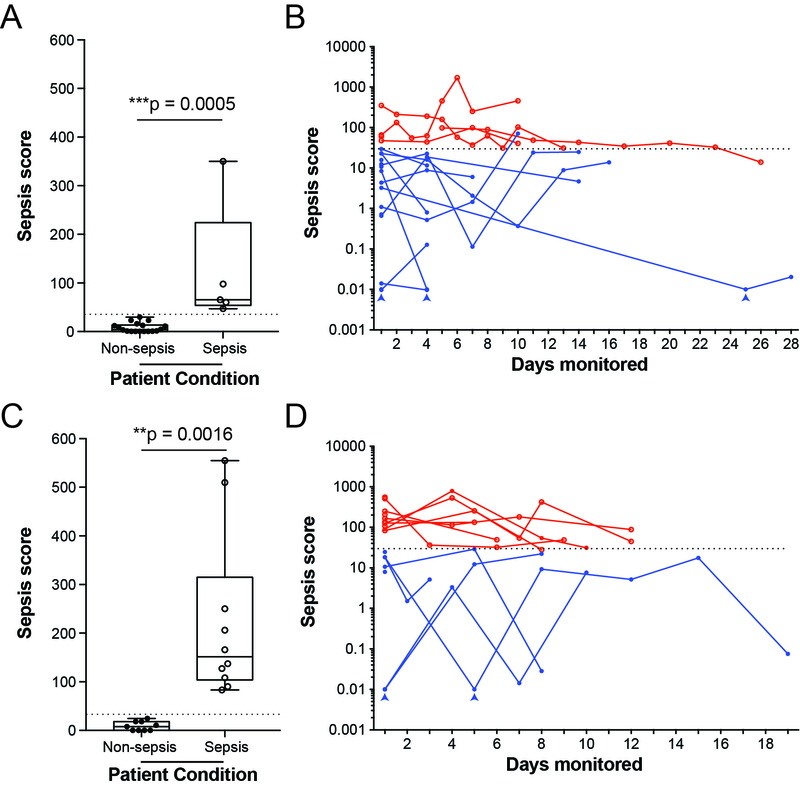 Spontaneous neutrophil migration patterns during sepsis after major burns. PloS One 9, e114509 (2014). 4. Hamza, B. & Irimia, D. Whole blood human neutrophil trafficking in a microfluidic model of infection and inflammation. Lab Chip 15, 2625-2633 (2015). Thank you for your interest! We got our fair share of critique, and responding definitely improved our final manuscript. :) Most comments required clarification regarding how sepsis was defined in this study, how the patient cohorts were chosen, how the machine-learning approach was used etc. Some questions, like "what is in the plasma of sepsis patients that drives this neutrophil behaviour? Why don't you just measure that?" were outside the scope of the study, but of course are the subject of ongoing research! Whether or not our approach works as an early diagnostic in a broader cohort of at-risk patients is also a great question, and one that we are working on actively.